The gypsy moth is an invasive forest pest from Europe that is one of the most damaging tree defoliators currently in the U.S. Aspen and oak top the list of over 500 preferred host species. 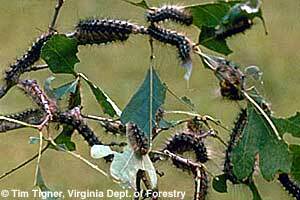 Gypsy moth caterpillars feed on leaves of deciduous trees and are present in early to mid-summer. Minnesota Department of Agriculture Gypsy Moth enacted a quarantine in Lake and Cook counties. Why are gypsy moths such a problem? They are voracious eaters and can completely defoliate entire trees. Outdoor recreation might be reduced as a result of bare trees, caterpillar presence on trees and roads, and feces falling from trees. Repeated defoliation can lead to the death of many trees, changing the mix of tree species and affecting dependent wildlife. Tree losses can impact forest and related industries. Because gypsy moths are nonnative, there are few natural enemies to keep them in check. Introduced to the U.S. in 1869, over the following 100 years, gypsy moth spread slowly across New England—primarily through caterpillar movement. Over the next 40 years, gypsy moth quickly spread as a result of human activities (motorized vehicles and tourism). 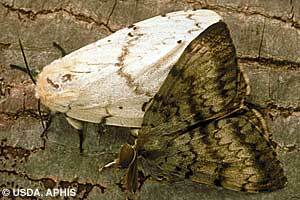 Today the area infested with gypsy moth spans across the eastern U.S. and into Wisconsin. The USDA Forest Service began a slow the spread program to help states on the advancing edge of gypsy moth infestation delay the establishment of the moth. Gypsy moth spread in the U.S. The Minnesota Department of Agriculture (MDA) has been monitoring (trapping) gypsy moth since 1970 and has successfully eradicated a number of small isolated infestations. In 2004, four Minnesota counties were added the slow the spread program because of high trap counts. In recent years, MDA has captured high numbers of male moths along the North Shore of Lake Superior. Based on moth capture rates and the presence of alternate life stages, MDA has proposed a quarantine for Cook and Lake counties, likely to be put in place in July 2014. What is Minnesota doing to manage gypsy moths? 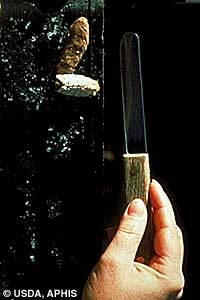 Gypsy moth controls include cultural, mechanical, and chemical controls; natural predators; and silvicultural practices. Unfortunately, because it's a nonnative pest, gypsy moth has few natural controls of the gypsy moth in the U.S. and none capable of preventing its eventual establishment in Minnesota. Various practices are used at different stages of population development. There are state and federal programs available at each stage to provide technical and financial assistance. You can play a major role in continuing to slow the spread of gypsy moth in Minnesota. Become familiar with the gypsy moth, its life cycle, and where it might be found. Inspect and remove gypsy moths from your vehicles and belongings when traveling in and out of infested areas. Buy firewood produced locally when visiting campgrounds or recreation areas. If you bring firewood with you, be sure to burn it all before leaving. Do not leave firewood for the next visitor. As a business owner, make sure all imported goods arrive with the proper certification. Support the MDA program and trappers placing traps in your neighborhood. Contact the DNR for assistance when developing a forest management plan. For more information about the MDA's gypsy moth program, call the Minnesota Department of Agriculture by calling the Arrest the Pest Hotline at [email protected] or 888-545-6684.